7:36pm: The three-team trade involving the Pelicans, Bucks, and Pistons is now official, according to press releases issued by New Orleans and Milwaukee. Milwaukee gets Mirotic, Detroit gets Maker, and New Orleans acquires two players and four draft picks, as detailed below. 11:57am: The Bucks are adding another shooter to their frontcourt, having reached an agreement to acquire Nikola Mirotic from the Pelicans, according to ESPN’s Adrian Wojnarowski and Zach Lowe (Twitter link). 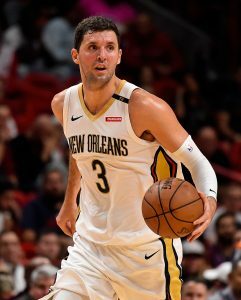 New Orleans will receive Jason Smith‘s expiring contract along with Stanley Johnson in exchange for Mirotic, Woj reports (via Twitter). According to Marc Stein of The New York Times (via Twitter), the Pelicans will also receive four second-round picks as part of the deal. A source tells Jake Fischer of SI.com (Twitter link) that two of those selections will be the Wizards’ 2020 and 2021 second-rounders, while Tim Bontemps of ESPN reports (via Twitter) that Denver’s 2019 second-rounder and the Bucks’ 2020 second-rounder are also in the package. Milwaukee just reached an agreement on Wednesday to acquire Johnson from the Pistons in exchange for Thon Maker, but that deal has yet to be completed. the Bucks wouldn’t be permitted to aggregate Johnson’s salary with another player’s contract for two months after acquiring him, so it looks the two deals will be turned into one three-team trade, which helps explain why Detroit and Milwaukee haven’t finalized their agreement yet. For the Bucks, this deal represents an impressive response to the Sixers’ acquisition of Tobias Harris on Wednesday. While Mirotic isn’t as dynamic a player as Harris, he should fit in very nicely in Mike Budenholzer‘s system, which already features a pair of sharpshooting big men in Brook Lopez and Ersan Ilyasova. Mirotic, who will turn 28 next Monday, has been limited by injuries so far this season, but has been his usual productive self when he’s on the court, averaging 16.7 PPG and 8.3 RPG with a .447/.368/.842 shooting line in 28.9 MPG. Mirotic is on an expiring contract, so the Bucks can add him to a list of free-agents-to-be that also includes Khris Middleton, Eric Bledsoe, Brook Lopez, and Malcolm Brogdon (restricted). Milwaukee will presumably attempt to retain as many of those players as possible in the offseason. As for the Pelicans, their return for Mirotic won’t match the first-round pick they gave up for him a year ago, but they won’t take on any future salary, and one or two of those second-round picks could fall in the 30s. They’ll also get a chance to take a look at Johnson, a former lottery pick who will be up for restricted free agency this summer. While the young wing never really blossomed into a reliable rotation player in Detroit, he still has some upside as a versatile defender, though he’d have to improve his shooting numbers to improve his value. The Pelicans will have to open up a roster spot with another trade or cut in order to finalize the deal. The Bucks, on the other hand, will create an opening on their roster, though they’re now less than $1MM away from the luxury tax line, ESPN’s Bobby Marks notes (via Twitter). Still a really good trade for the Bucks. They add another shooter that should be able to fit next to Giannis. Mirotic will likely end up splitting most of his time with Lopez, giving the Bucks two good stretch bigs. Ok? Why does that matter? They didn’t give up anything, got 4 second round picks, and are in a better position for a championship run this year. The Pels got the secondrounders. The Bucks had to keep up with rivals. IDK what the Pistons are doing. You mean the Pelicans will receive Jason Smith and Stanley Johnson ? Yeah, I think they got that reversed. Stanley, how was your stay in Milwaukee? Tweet says bucks are sending 4 picks, not receiving. FOUR. Everyone wants 4 picks. Just hearing the sound drop now. I wouldn’t say second round picks are worthless. A high second round pick has value to scoop up any first round guys who slip in the draft. And they’re nice sweetners in any trade without having to include an extra player. Ok aside from picks 30-35 in some drafts you get mostly guys you replace with guys on minimum contracts. And as you say they yourself they are mostly just lubrication for trades si a team feels like they are getting something more. They rarely and I mean rarely worthwhile. Michael Redd with a big howdy. Malcom Brogdon says pffft. Sorry guys, initially had Bucks and Pelicans flipped in the second graf. It’s been updated and fixed now. First good move this trade deadline that Demps has made. Turning Mirotic into Stanley Johnson and four second round picks while not compromising future cap space (via Smith’s expiring). Johnson isn’t anything special but he’s worth a gamble for the Pelicans. I agree. I think this is a good trade for the Pels. Love this. After several years of dysfunction, it’s awesome to see the Bucks make aggressive moves like this. Dare I say that Milwaukee could be a place players actually want to play in? They have strong ownership, a great new coach and system, a beautiful new arena, and a star player. The stars are aligning. Yea, but it’s Miiiiilwaukeeeee. Yuck. Not if you’re rich and are just going to cocoon in after work anyway. The Bucks will have done enough this summer just to re-sign their own guys! Those “mediocre” players have the best record in the NBA. Great series of trades to significantly upgrade their roster. I can still see them looking to offload Ersan since having both Nikola and him is a bit redundant. I’d loved for them to send Ilyasova to Atlanta for Dedmon or Len to free up even more cap space this offseason. Otherwise I’d be looking at potential buyout candidates like Robin Lopez, Wayne Ellington, Zach Randolph, Enes Kanter and Wesley Matthews to add another bench contributor. I suspect DJWilson will back up center and Mirotic will x-factor. This is the team I would love to see them keep together for the next couple of years. They have around 60 million in guarantee contracts for next year and the cap line will be around 110 million and luxary line around 130 million. That will leave the Buck’s around 70 million to sign all of their own free agents. Kriss will probably take around 25 of that and Bledsoe around 18. That will leave around 27 for Malcom, Brooke, and Nikolai. I don’t think that’s enough but we will see. Brogdon is restricted so they can let the market decide. Bledsoe may require more than 18 or depart. Dragic could replace him, or Beverly, since Brogdon can do point work. Are second round picks even worth it any more? A guy that will be a major part of the rotation and see twenty plus minutes a game for two guys that were lucky to see twenty minutes in a week. The future is now. Thong Maker should generate a decent return!